Sometimes referred to as a hot tub cover tarp or spa cover weather guard, our Spa Cover Caps provide a layer of protection for your traditional hot tub cover from the elements. We know it sounds crazy to cover up a hot tub cover. We are not advocating you use it year-round. However, with traditional spa covers representing a $300-$500 investment, why not use a spa cover cap to protect it from periods of long sun exposure in the summer and bouts of ice, snow and freezing rain in the winter. You would not believe how many calls we get a year from customers saying they accidentally ripped their spa cover vinyl skin shovelling snow off of it. Our Spa Cover Caps are constructed of tough woven polyethylene fabric which is made right here in the USA. This rugged material is used in everything from retaining pool liners to industrial construction tarps. 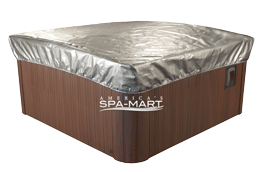 The silver color helps to reflect the harmful sunlight away from the spa cover. The Spa Cover Cap is available in four standard sizes and can be custom-made to fit most applications.